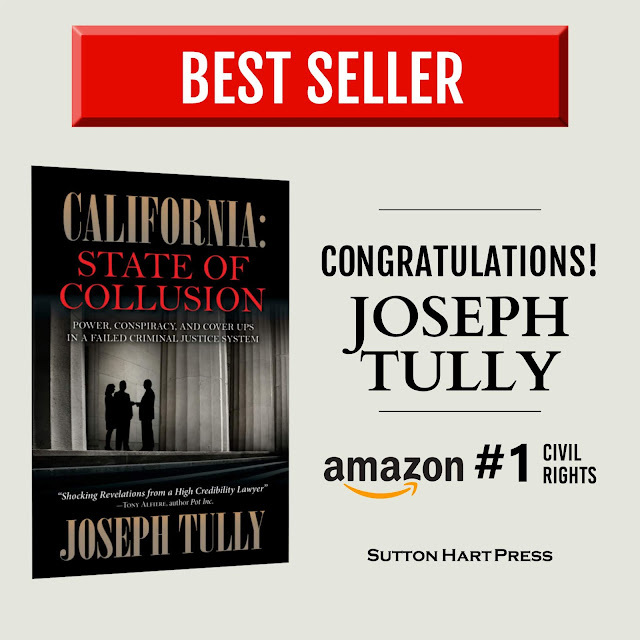 California's best criminal lawyer "Joseph Tully exposes power, conspiracy, and cover-ups in the Golden State's failed criminal justice system..."
California's best criminal lawyer, Joseph Tully, adds Best Selling Author to his legal bio with his book California – State of Collusion (Sutton Hart Press) hitting #1 on Amazon in its category the first week. California: State of Collusion looks at entrenched conspiracy among the Golden State's judges, prosecutors and police - fabricated testimony, doctored evidence, proof of innocence buried, and judges turning a blind eye while imposing voter-pleasing sentences and ignoring misconduct to satisfy police unions at election time. Attorney Joseph Tully delivers frightening examples of police, prosecutors, judges and politicians acting badly from Redding to the San Francisco Bay Area to Silicon Valley, Los Angeles and everywhere in between. One of California's most successful and controversial criminal defense and civil rights lawyers, Contra Costa based legal author Joseph Tully helps people defend their liberty and reputation in a deeply flawed and unjust legal system. With an unparalleled record for earning Not Guilty verdicts in major felony cases, Tully's work has been featured on 60 Minutes, in Rolling Stone Magazine, the Los Angeles Times and in outlets across the U.S.